If you're visiting Wollongong or Nowra, or birdwatching around Jervis Bay and Booderee National Park, it's essential to check out Barren Grounds Nature Reserve and Budderoo National Park. I've been there a few times, most recently in February 2015, dropping into the reserve after twitching the White-rumped Sandpiper, a vagrant American wader that somehow turned Lake Wollumboola. Approximately 2000 ha, Barren Grounds was originally gazetted a fauna reserve in 1956 to protect the habitat of the endangered Eastern Bristlebird and Eastern Ground Parrot. In 1967, it formally became Barren Grounds Nature Reserve; while in 2009 it was declared an Important Birds Area by Birdlife International. 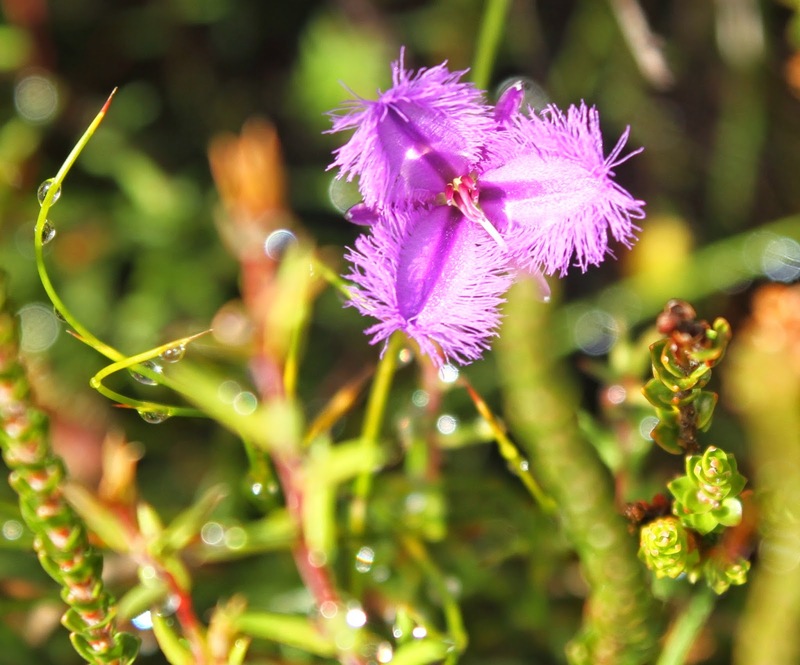 It's also one of only four large areas of heathland on the NSW south-coast, the others being Royal National Park, Jervis Bay National Park and Nadgee Nature Reserve. 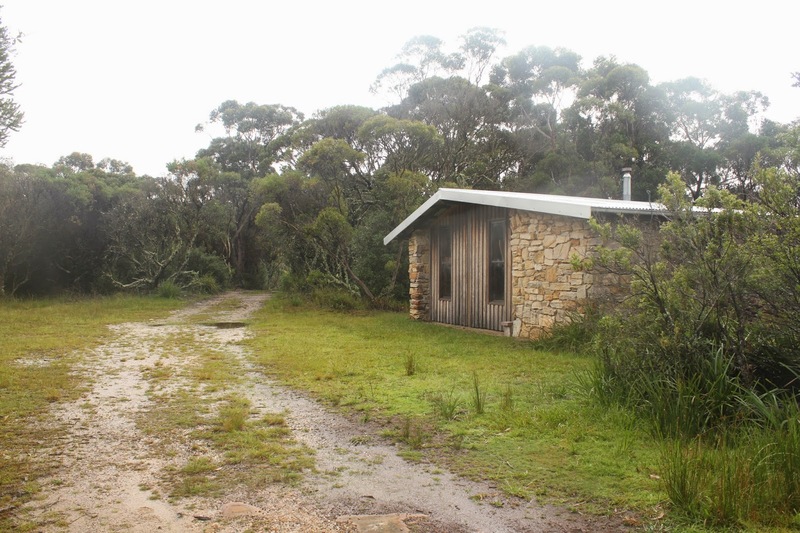 It was once managed under lease by the RAOU (Birdlife Australia) and had an operating bird observatory that consisted of a visitor information centre, wardens house and accommodation. Barren Grounds habitat-type is formally classified as a 'hanging swamp plateau'. 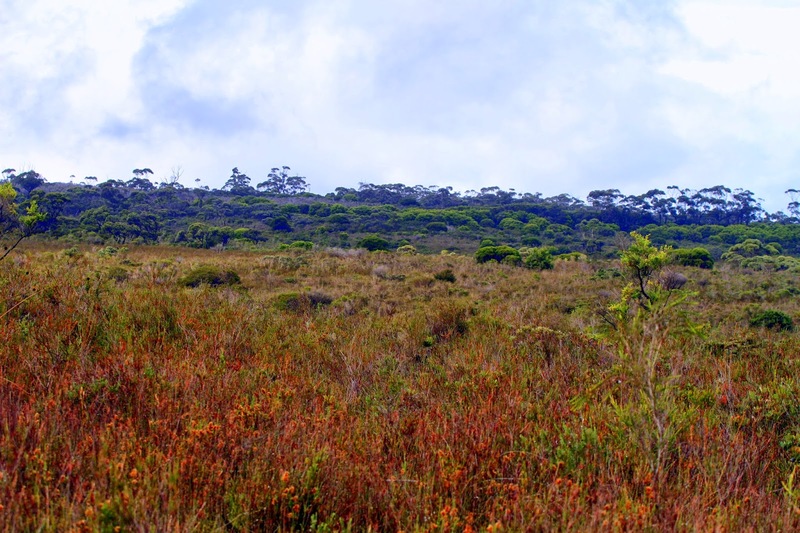 This is because 1) it contains large areas of heath and swamp in an elevated position, being approximately 600 m above sea level, and 2) it has high levels of rainfall. The weather at Barren Grounds is unpredictable, to say the least. Typically, when visiting, the whole plateau is often shrouded in swirling mists with drizzle. The roadside advice given when driving up the escarpment to the reserve is to turn on your headlights, even during the day. Despite this, in fact because of this, it's a wonderful place. This is because you can see some rare birds with relative ease. It's a time capsule, like Conan Doyle's Lost World, a hanging garden on top of an ancient escarpment! 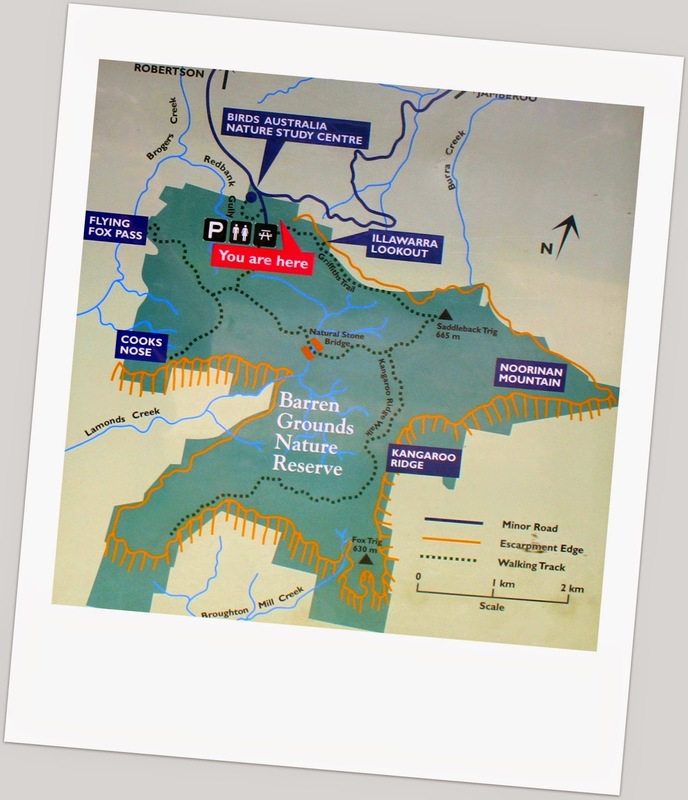 The entrance to Barren Grounds is 19 km west of Kiama off the Jamberoo Mountain Rd. Facilities are basic, there's a picnic shelter, toilet and barbecues. Being a nature reserve there's no camping allowed in Barren Grounds. However walk in / bush camping is permitted nearby in Budderoo National Park and Macquarie Pass National Park If you do plan to bush camp, probably the best spot is along the Budderoo Track, driving down about 500 m or so - perhaps camping just after the gate. 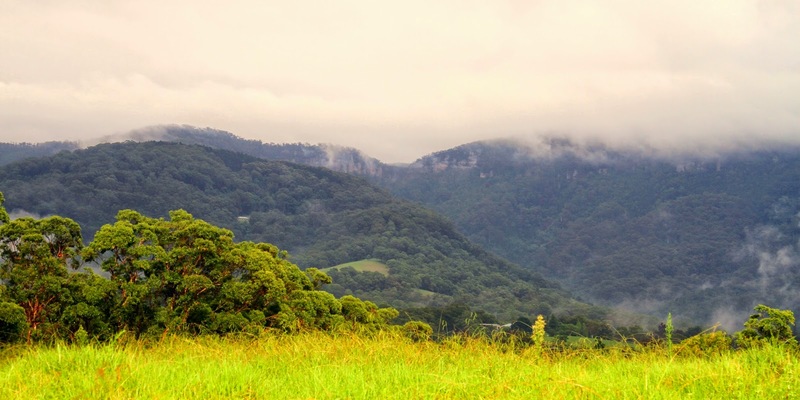 There are formal camping areas nearby in Morton National Park, Seven Mile Beach National Park, the Bendeela area in Kangaroo Valley, Carrington Falls Reserve and there's a number of privately operated camping areas. It sits on an exposed coastal sandstone plateau with shallow and moderately damp sandy soils. These soils are low in nutrients, particularly those vital for plant growth, such as phosphorus, nitrogen, potassium and magnesium. The unproductiveness of the soils has largely protected the heath from agricultural development. However, far from being barren - as the name suggests - it is a spectacular environment! 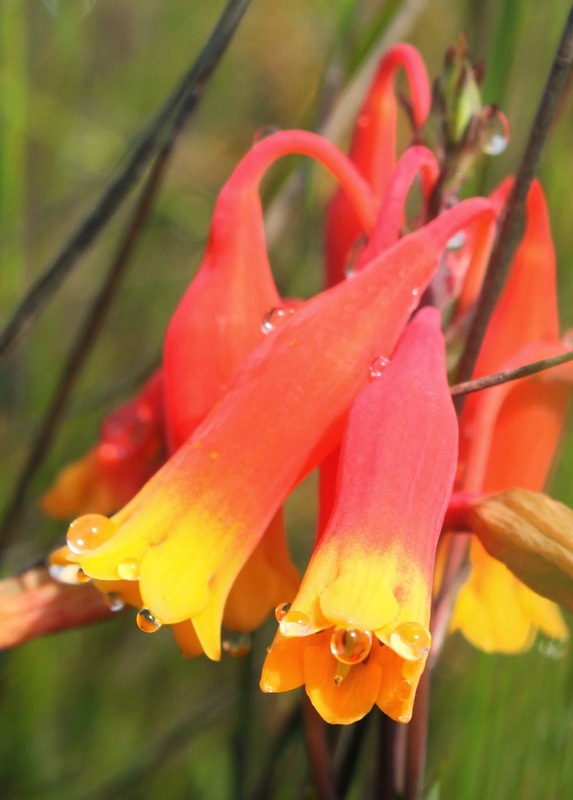 Its biodiversity is testament to Australian native plants adaptability to poor soils. 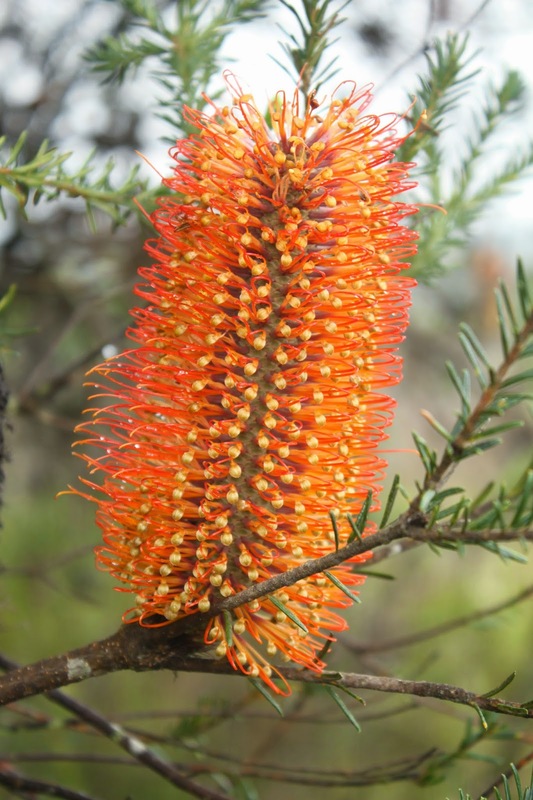 Plants we have all come to love, such as the nectar-rich Heath Banksia (Banksia ericifolia) or the beautiful Christmas Bell (Blandfordia nobilis). Our native wildlife also loves them, the birds, mammals and insects. As birdwatchers and natural historians we really appreciate that. From what I can see, the main trees around the reserve are Red Bloodwood (Corymbia gummifera), Silver-top Ash (Eucalyptus sieberi), Heart-leaved Stringybark (E. camfieldii), Yellow-top Ash (E. luehmanniana), Sydney Blue Gum (E. saligna) and Port Jackson Mallee (E. obstans). That's a nice selection gums. Significantly there's a wonderful variety of Banksia, including Heath Banksia (Banksia ericifolia), Old Man Manksia (B. serrata) and Dwarf Banksia (B. oblongifolia) and Swamp Banksia (B. paludosa). 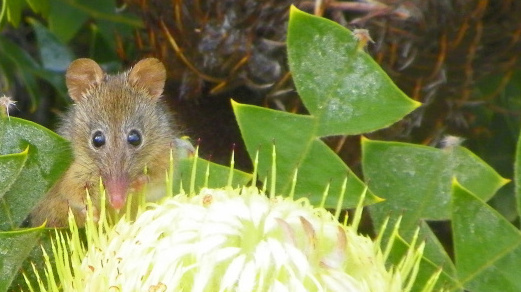 These are all an important food source for honeyeaters such as the Tawny-crowed Honeyeater, and possums such as the Eastern Pygmy Possum. Pouched Coral Fern (Gleichenia dicarpa) is common in the reserve. In places, such as along the sides of the walking tracks, it is the dominated ground cover. Here it forms tangled thickets, good habitat for Eastern Bristlebird. Its tangled roots are also important for the prevention of erosion along the reserves tracks. 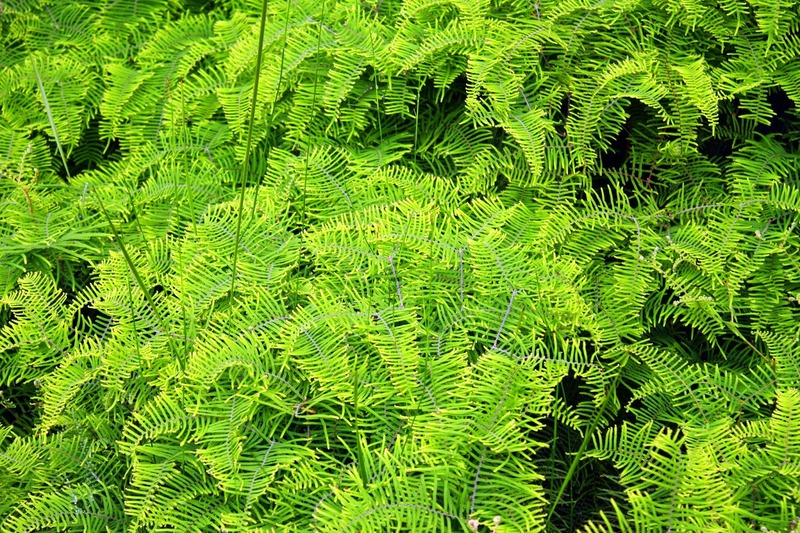 Pouched Coral Fern is considered a 'pioneer species'. These are hardy species that first colonize previously disrupted or damaged ecosystems, a process that begins the chain of ecological succession that leads to a more biodiverse steady-state ecosystem. So, obviously, Pouched Coral Fern is a very an important plant at Barren Grounds. 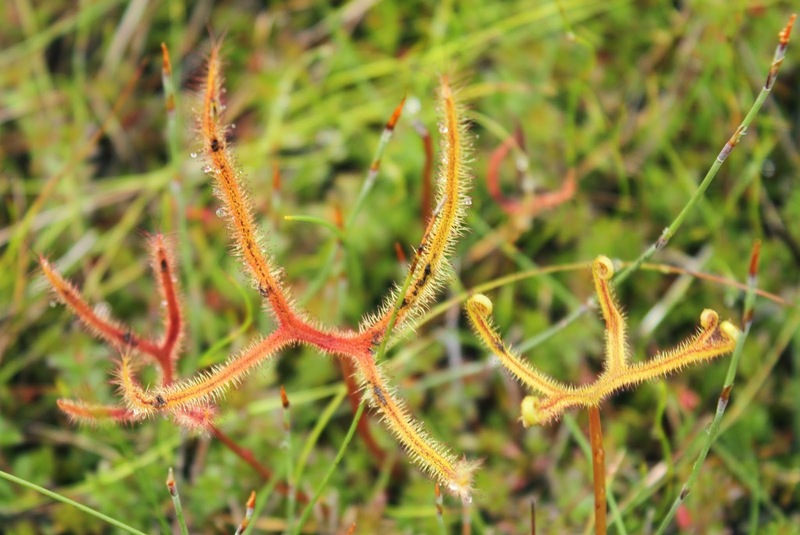 Sundews, such as Shield Sundew (Drosera peltata) and the intriguing Forked Sundew (Drosera binata), do what Sundew do - trap and eat insects for extra nutrients. Forked Sundew is known for its ability to become a large insect-catching "bush". With around 180 different species of birds, Barren Grounds was declared a special reserve because of the presence of two endangered species, the Eastern Bristlebird and Eastern Ground Parrot. It's also particularly good for seeing other heathland specialists such as Beautiful Firetail, Southern Emu-wren and Tawny-crowned Honeyeater. While more generalist birds in the reserve include Superb Lyrebird, Pilotbird, Rock Warbler, Brown Cuckoo-Dove, Topknot Pigeon, Black-faced Monarch, Eastern Whipbird, Painted Button-quail, Brown Quail, Bassian Thrush, Red-browed Treecreeper, Variegated Fairy-wren, Large-billed and Yellow-throated Scrubwren. Fourteen species of honeyeaters have been recorded including Crescent, Lewin's, Fuscous, White-cheeked, Scarlet and White-eared Honeyeater. It's also good for parrots and cockatoo: these include Gang-gang Cockatoo, Yellow-tailed Black-Cockatoo, Galah, Rainbow Lorikeet, Australian King Parrot, Crimson and Eastern Rosella, Turquiose Parrot (uncommon) and, of course, Eastern Ground Parrot. Interesting raptors to look out for include Peregrine Falcon, Grey Goshawk, Collared Sparrowhawk, Wedge-tailed Eagle and there's a chance of Pacific Baza - near the southern most distribution for this species. 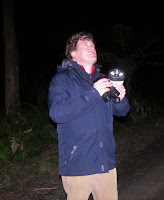 While nightbirds include Powerful Owl, Southern Boobook and Eastern Barn Owl. There's also a chance of seeing uncommon species such as Lewin's Rail, Chestnut-rumped Heathwren, Australian Logrunner (in rainforest areas) and Turquoise Parrot. 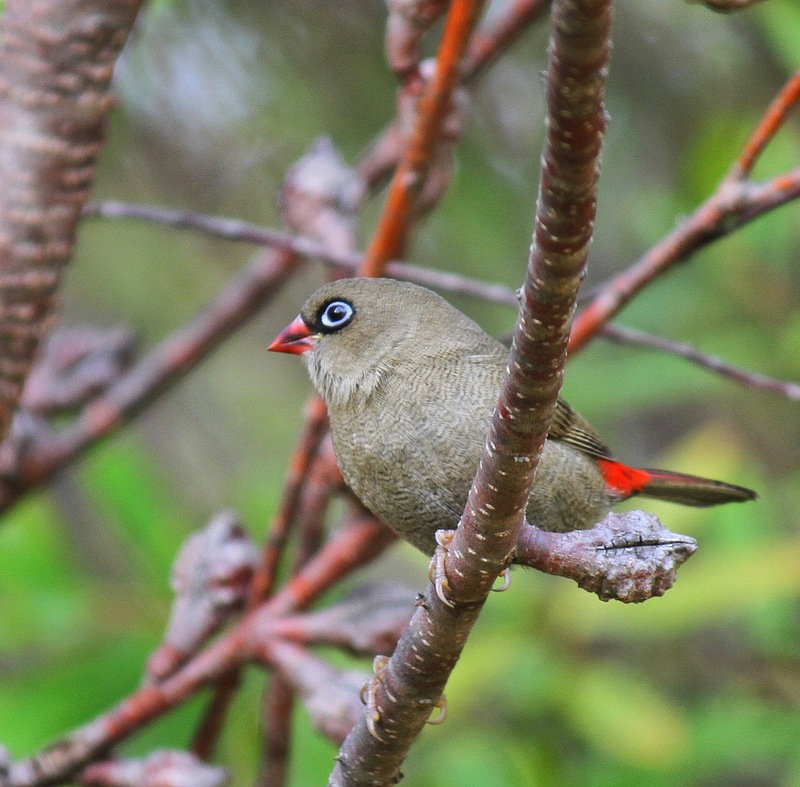 The best bird walk in the reserve is undoubtedly the Griffiths Trail, an 8 km loop that begins at the picnic ground. It's the main walk in the reserve, with a couple of tributaries. Being a loop, you can start your walk at either end. I started at the western end. Here it heads out to a natural stone bridge, and then loops back to the picnic area via Saddleback Trig. The Griffiths Trail traverses through a range of vegetation communities, including heath and some nice tall eucalyptus forests. 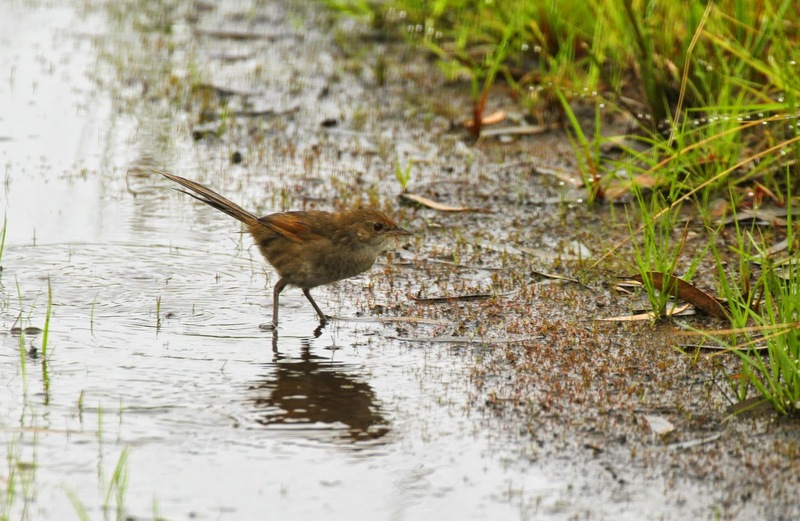 Eastern Bristlebird searching for insects in a puddle. 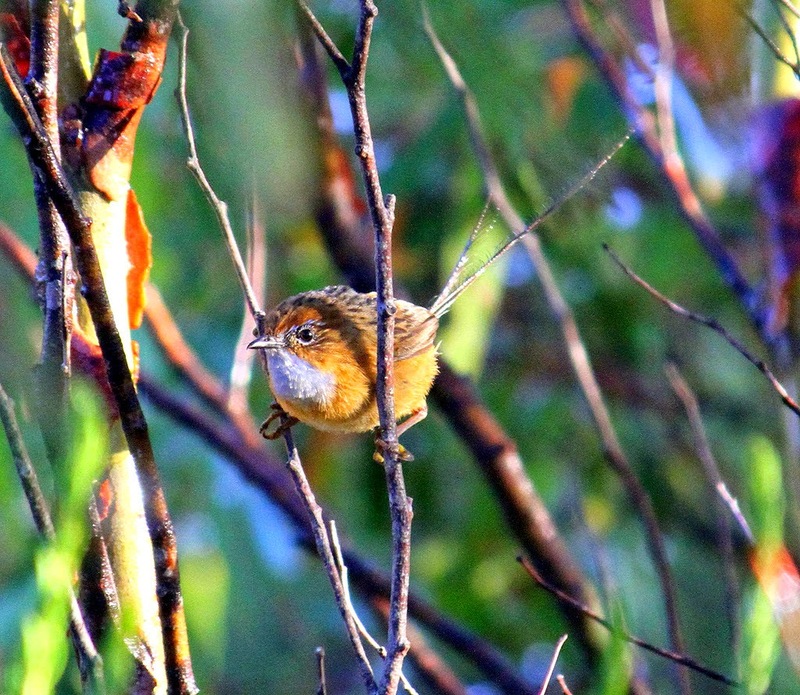 To me, it seems so strange that at Howe Flat and Nadgee Eastern Bristlebird are so elusive, so hard to see. However, at Barren Grounds, they run across tracks and drink from puddles out in the open. For instance, after several hours of birding along the Griffith Trail, I had seen at least eight different birds, all with some ease. In fact, at one spot I asked a bird if he could please give me a better views. To which, he replied "yes". Or at least that's what I thought he said. He certainly jumped out into the open and said "hi" or, being slightly anthropomorphic, perhaps he was telling me "bugger off". Whatever the case, late February is clearly a good time to see them. It's after the breeding seasons, they have lost their sense of territoriality, and there is a whole bunch of young birds running around wanting to impress. 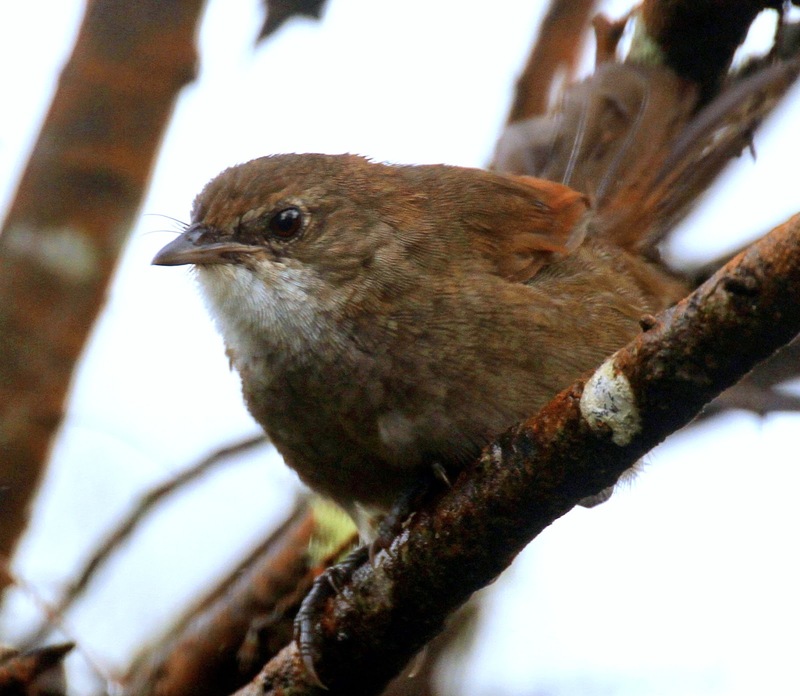 Despite this, research by people such as Jack Baker (a former Vice President of Birdlife Australia), has shown that population densities of Eastern Bristlebird are low compared to those of other heathland birds. At Barren Grounds, there's a maximum densities of about 4 birds per 10 hectares. With a total world population of less than 2500 birds, it's estimated that approximately 600 live at Barren Grounds and the adjacent Budderoo National Park (discussed below). Around Wollongong - aside from Eastern Bristlebird being present at Barren Grounds and Budderoo - they have been records at Fitzroy Falls and the Upper Kangaroo Valley (15 km w of Barren Ground), and at Red Rocks and Cambewarra Range Nature Reserves (5 km s-e) (where there's also a small population of Brush-tailed Rock-Wallaby). The good news about this is that it tells us that there is some dispersion of Eastern Bristlebird through suitable corridor habitat. At the beginning of the western section of the Griffith Trail, near the old bird observatory, there is a fire trail - it is sign-posted 'Service Track only'. This trail leads west down to Redbank Gully Creek, and is approximately 1 km return. The low-lying heath along this trail is good for Eastern Ground Parrot; listen at dawn and dusk for their distinctive resonating call. 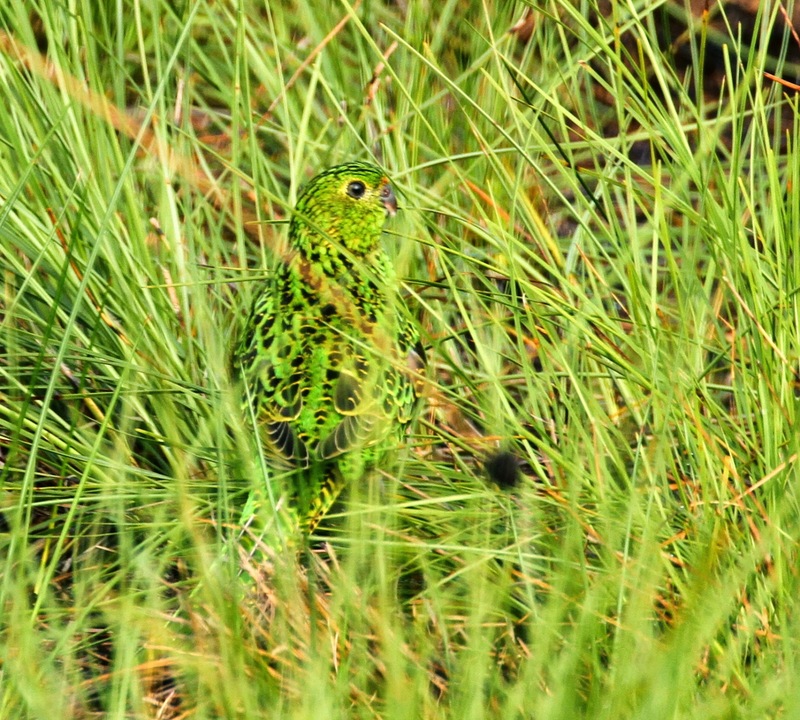 Eastern Ground Parrot are present in reasonable numbers at Barren Ground, with recent surveys regularly recording between 20 to 40 parrots. Recent indicates fire management is particular important when dealing with populations of Eastern Ground Parrot. They tend to occur in heath growth 1 to 20 years post fire, with their population stabilizing after ten years. After about 10 years, in optimum habitat (like Barren Grounds) their approximate densities is about 3 birds per 10 hectares. Typically, for their survival, it's important to have a mosaic of fire ages in a given region, spanning between 0-30 years. So, luckily for me, the birds re-landed on the track and I was able to get some excellent views and some nice images. After seeing the bird, I meet a group of birders who'd not seen Ground Parrot before, despite many attempts. I explained where I'd seen the bird, so they rushed down to see it. When I saw them again kater, they explained they had dipped. Despite standing in the rain for several hours, and in the exact spot where I saw the bird. Luck. 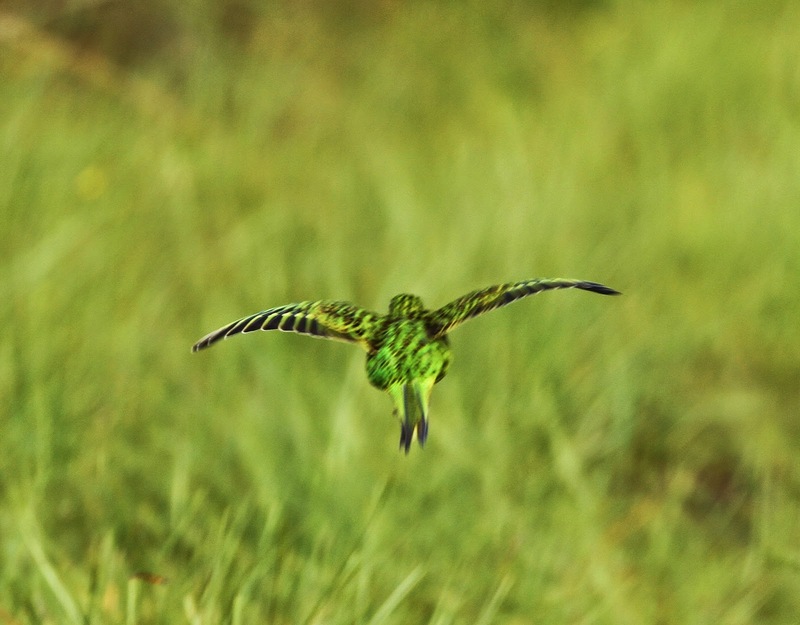 Fortunately, I've seen Eastern Ground Parrot at quite a few places in Australia: in the heathland in Croajingolong (Vic), at Jervis Bay (NSW) near Strahan (Tas), and in the Great Sandy National Park (Qld). So that's every state that they occur in Australia. Now I can add Barren Grounds to that list. From here, I reckon I need to join one of the Friends of the Western Ground Parrot survey groups and look Western Ground Parrot in WA. Wish me luck. 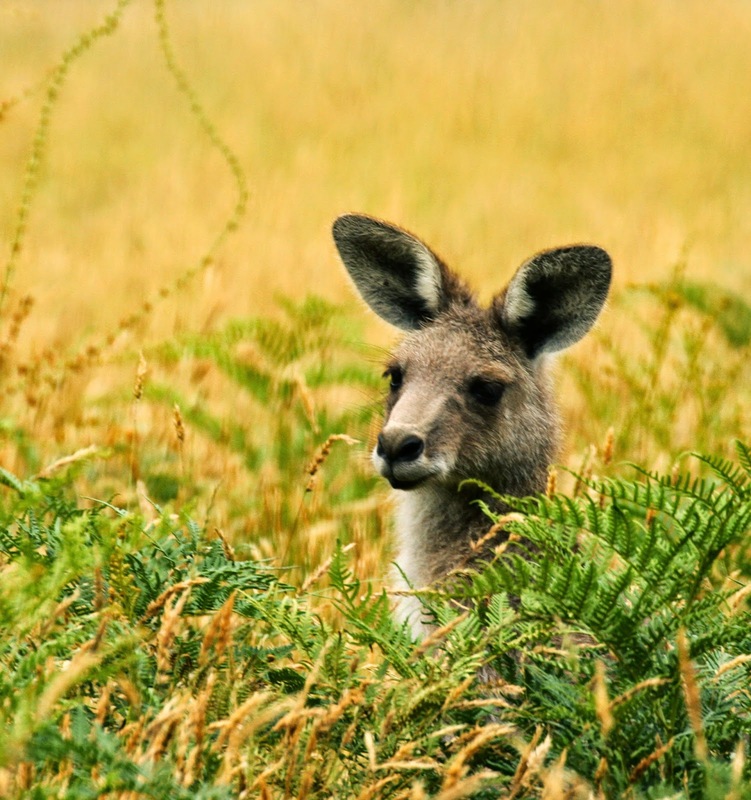 If you have time, or the will, walk the 20 km Kangaroo Ridge Walk. It's a long grassy open track that travels over undulating heath country. Keep a look out for Eastern Ground Parrot and Brown Quail feeding on the track, and look for Beautiful Firetail, and Southern Emu-wren in the adjacent heath. This walk is probably the best in the reserve for raptors, such as Grey Goshawk, Brown Goshawk and Collared Sparrowhawk. Once at the edge of the Illawarra Escarpment the views of the Berry district are fantastic. Here, there is a chance of seeing Peregrine Falcon, which nests on the cliffs near here. It's worth noting that the Kangaroo Ridge Walk can be very wet and muddy after rain which, unsurprisingly, happens quite a bit at Barren Grounds. In spring, when the wildflowers are blooming, the Herbarium Walk - it's about a 1.5km loop - is particularly good for honeyeaters such as Crescent, Lewin's, New Holland, Yellow-faced, White-cheeked and White-eared, and, occasionally, Fuscous and Scarlet. Information about reptiles and amphibians in Barren Grounds is limited when compared to the birds and mammals. 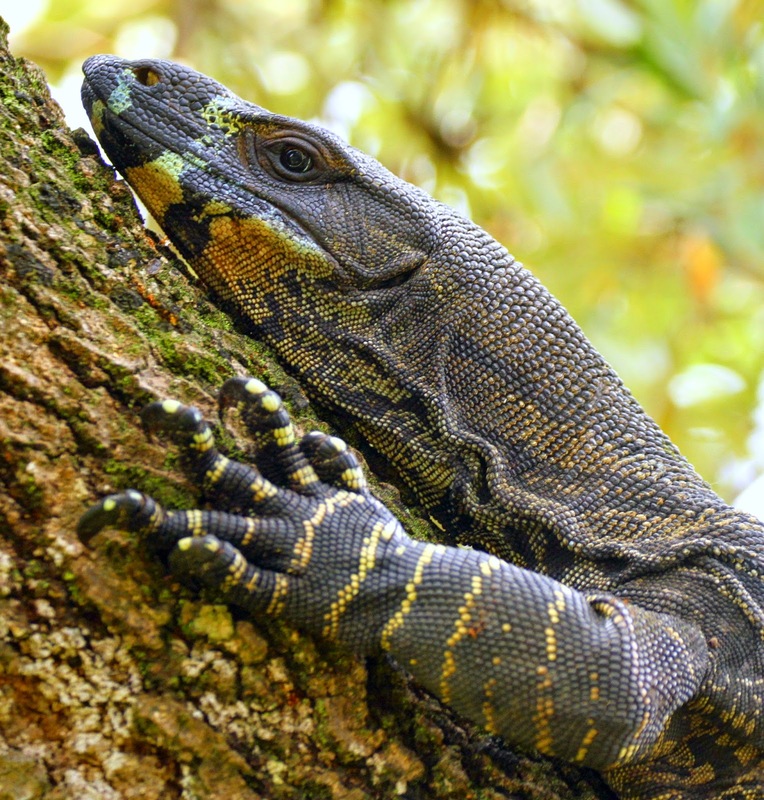 12 lizards have been recorded, including the Lace Monitor and Eastern Water Dragon, while there are 11 species of snake, Swamp Snake, Green Tree Snake, Red-bellied Black Snake and Copperhead, while Broad-headed Snake may occur. Being very swampy, frogs are well-represented, with 14 species including three that are threatened - the Giant Burrowing Frog, Giant Barred Frog and the spectacular-looking Red-crowned Toadlet. In terms of butterflies, when I was there, the beautiful Swordgrass Brown was common in the heath. In Budderoo National Park, at the base of the escarpment, it may be worth visiting the Minnamurra Falls. It's a great place to see Superb Lyrebird - when I was there, they were foraging around the car park. There are a couple of walks that pass through rainforest, where birds such as Satin Bowerbird, Yellow-throated and Large-billed Scrubwren, Rose Robin, Bassian Thrush, Brown Gerygone, Lewin’s Honeyeater occur while, in summer, you might see Brown Cuckoo-Dove and Topknot Pigeon. Now the bad news about Minnamurra Falls. It's worth noting that the walks are only opens between 9:00 am and 5:00 pm, not particularly good hours for a visiting birdwatcher. Pity. Indeed, the last time I visited I arrived in the car park at 8:45 am i.e. fifteen minutes early. One of the park rangers approached and asked me to leave. I politely explained that I'll just wait by my car, and have some breakfast, "I'm birdwatcher, I can look at the birds around the car park. Wow, look at that Lyrebird". The ranger then insisted I leave, and if I didn't he will get some other rangers and force me to leave, perhaps even call the police. What! This was extraordinary! Arrested for being 15 minutes early in a national park car park. What kind of madness is this? After about 10 minutes of lively debate, I headed out of the car park - about five minutes before walks officially opened. As I was leaving, a groups of cyclist arrived. Interested to see what would happen, I waited at the park entrance. Sure enough, the rangers asked them to leave! As they rode past me, one of them said "They're f@#%'n crazy!" . Yep, they clearly are. What's was more confounding about this was, by the time the cyclist actually left, it was just after 9 am and the park walks were therefore open. Something is clearly going wrong with park management of the Minnamurra Falls! So, the moral of this story is, if visiting Minnamurra Falls, visit with caution. Or you might get yourself arrested for being slightly early. The area of rainforests is one of the most southerly strongholds for a number of birds that depend upon fruit of these rainforest tree for their diet. 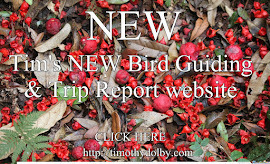 These include birds such as Green Catbird, Emerald Dove, Brown Cuckoo-Dove, Topknot Pigeon, White-headed Pigeon, Logrunner, Channel-billed Cuckoo, Australasian Figbird, Yellow-throated Scrubwren and Spectacled Monarch. Some of the other birds you might see along the walk include Superb Lyrebird, Olive-backed Oriole, Crescent and Lewin's Honeyeater, Black-faced Monarch, Leaden Flycatcher, Rose Robin, Large-billed Scrubwren, Bassian Thrush and Brown Gerygone. There are also records of Red-whiskered Bulbul. Threatened mammals in the park include Tiger Quoll and Long-nosed Potoroo - so it may be worth doing some nighttime mammal-watching. 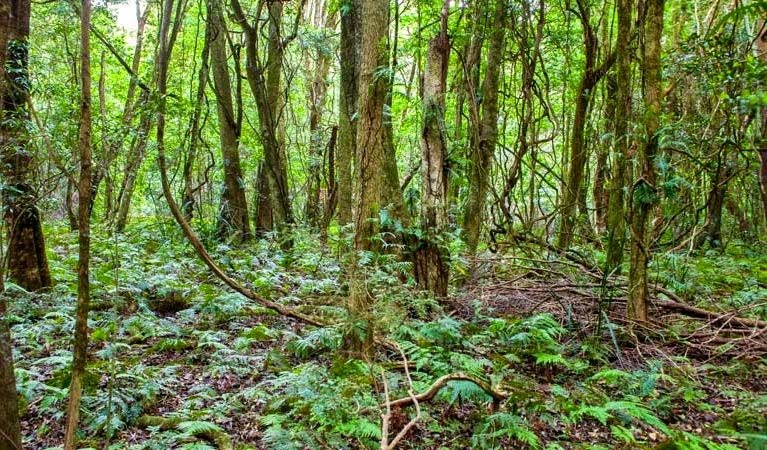 Located near the edge of the Illawarra Escarpment, the Robertson Nature Reserve is a small reserve, approximately 5 hectares in size. To get there, from the main street of Robertson, turn south at the intersection near the hotel, cross the railway line, then turn left at the T-intersection. The reserve is a little way along on the right. Robertson Nature Reserve protects a remnant area of 'Yarrawa Brush'. Brush, in this sense, is the name given to a forest with a dense understorey. Originally Yarrawa Brush covered 2500 hectares of the eastern part of the Highlands. Apart for isolated pockets of scrub, only this 5 hectare portion remains of the original rainforest. The high rainfall and heavy mists create a micro-climate particularly suited to birds who like cool, temperate rainforests. Despite its size, it can be very birdy. After a short walk along the 600 m track, I recorded Brown Cuckoo Dove, Wonga Pigeon, Shining Bronze-Cuckoo, Satin Bowerbird, Lewin's and Yellow-faced Honeyeater, Large-billed and Yellow-throated Scrubwren, Brown Gerygone, Rufous Fantail, Black-faced Monarch and Bassian Thrush, to name a few. If visiting at night, keep an eye open for Tigor Quoll, which are said to inhabit the reserve. Aside from the birds, the reserve is worth visiting just for the plant. For instance, you can see a lot of trees with the word 'wood' in their name: Featherwood (Polyosma cunninghamii), Possumwood (Quintinia sieberi), Coachwood (Ceratopetalum apetalum), Blackwood (Acacia melanoxylon) and Pinkwood (Eucryphia moorei). Other trees include Sassafras (Doryphora sassafras), Lillypilly (Acmena Smithii), Cabbage Tree Palm (Livistona australis) and Pencil Cedar (Polyscias murrayi). The ground cover is a mixture of shrubs such as Orange Thorn (Pittosporum multiflorum) and Soft Tree Fern (Dicksonia antartica). As can be seen by the image below, vines are a prominent feature of the Yarrawa Brush - clearly responsible for how it got its name. You could visit the reserve just to 'twitch' vines Do people do that? Here's a list of some you may see: Wonga Vine (Pandorea pandorana), Anchor Vine (Palmeria scandens), Common Milk Vine (Marsdenia rostrata), Five-leaf Water Vine (Cissus hypoglauca), Gum Vine (Aphanopetalum resinosum), Staff Vine (Celastrus australis) and Pearl Vine (Sarcopetalum harveyanum. Finally, it's worth dropping into Fitzroy Falls, located in the north-eastern section of Morton National Park. 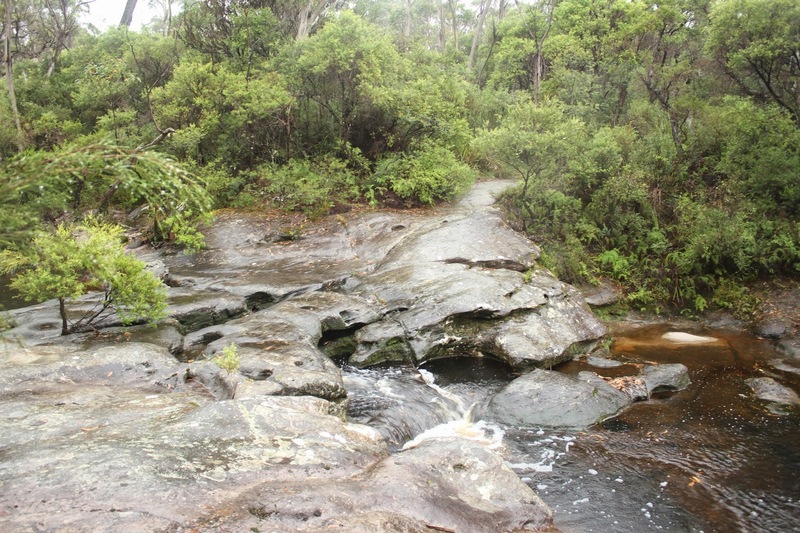 The falls is situated where Yarrunga Creek plunges from a sandstone escarpment into the valley below. 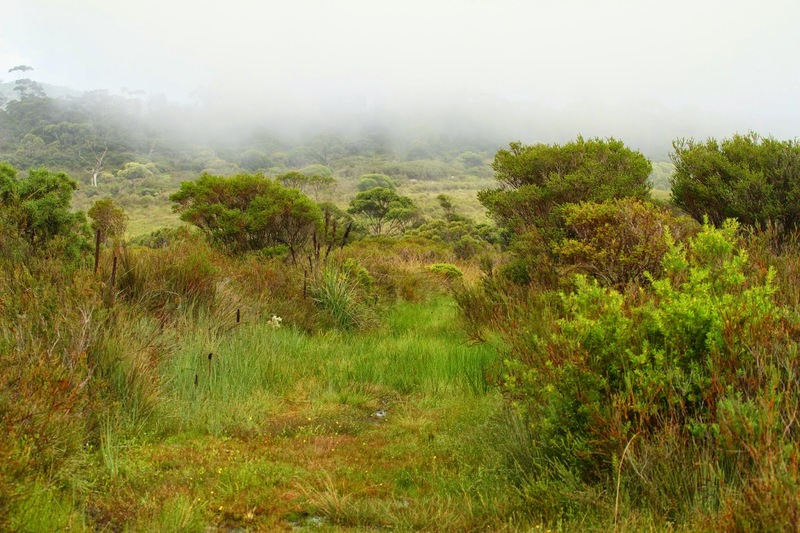 There's good range of plant communities such as rainforest, dry eucalypt forests, and plateaus of wet sedge and heathland. And, if you want to camp, there's a campground at Gambells Rest. Similar birds occur along the West Rim Track, it's about 4 km return. Along this walk, a steep staircase leads down to a cool ferny gully known as the Grotto. Rockwarbler feed along the rocky stream just before the Grotto. Pouched Coral Fern (Gleichenia dicarpa), scattered throughout Barren Grounds. 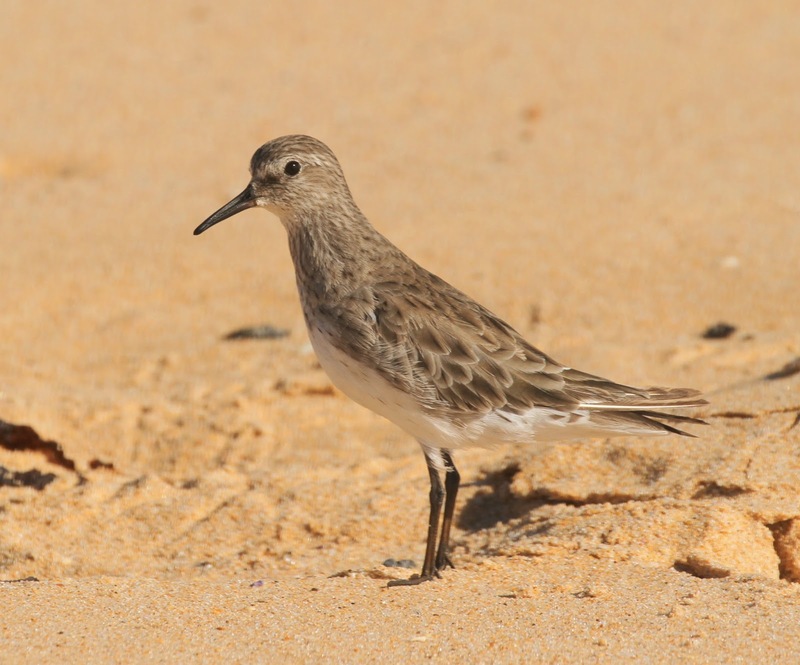 The reason for my recent visit: a White-rumped Sandpiper, an extremely rare Vagrant to Australia. You're not likely to see them at Barren Grounds! But, at Lake Wollumboola near Nowra, there's always a slight chance.